Life sometimes feels like tortured repetition. A bit like going to the gym. But at least at the gym you get fitter. When it comes to politics, life feels like a running machine which keeps you running but makes you fatter, more depressed and more miserable until the rolls are seeping out from under your lycra trouser leg, over the circulating rubber, down the stabilising side and out onto the manmade fibre carpet. I’m thinking about the BBC’s refusal to broadcast the Gaza appeal for humanitarian agencies, which has had me yawning and yelling in equal measure. As a former employee and correspondent of the BBC World Service, the one thing that strikes me about all of this is quite the extent of the hypocrisy. It’s so alarmingly vast. During the seven odd years I worked for the BBC – both as a correspondent in the, er, ‘field’ and as a producer and sometime editor on the desk – I was always infuriated and intrigued by the amount of pressure we all were under to rely on information provided by foreign aid agencies (all Western, mostly British, American and French or Belgian or Dutch etc). The moment one of the big agencies – CARE, Save the Children, Oxfam, and any UN department – produced a report or issued a press release about yet another ‘worst humanitarian situation’ (they are, believe me, always the worst), the team would always want to run the story. Various reasons were and still are behind this: it’s easy to get an aid worker on the phone (even an ISDN line), they usually speak English, they will be concise, and free, and more often than not they are always willing to speak. Much easier to chat to pressperson X from the WFP in the middle of Darfur, than track down a local Sudanese who has intermittent access to a wobbly mobile phone and doesn’t speak a word of English. Such are the time pressures of modern day broadacsting, most producers and editors (culled to the minimum on each show) will go for the easy and reliable and cheap option. Aidworkers fit this description perfectly. Nevermind if their information is inevitably partisan. (No one knows everything: remember!) Even in the Africa service, for which I worked, and even among African staff, the accepted opinion was it was better to get information and an interview from a foreign NGO or the UN than a local NGO or civil society association. Such is the overlap between the BBC and aid agencies, many BBC staff end up going to work for them. I could provide a long list of former colleagues who now work for the WFP as spokesmen and spokeswomen, as press writers and publicty experts. I know people who’ve gone to Cafod, all branches of the UN, Oxfam, and countless others. The attractions – particularly to the UN – can be summed up in one word: money. The UN pay ever so nice and you get a nice house in a sunny country with free education for the kids, plus extras for moving and extras for all sorts of other stuff. You might get a driver, you’ll definitely get a car. Etc etc etc. Even after all the horrible things I wrote about the UN and aid agencies, I was offered a job twice by the UN as a spokesperson. Because of this link – between ex BBC staff and aid agencies – the BBC is even more inclined to interview its ex-reporters who now work for agency Y or Z. I used to chuckle so loudly when I heard former BBC reporters suddenly being ‘grilled’ by their former colleagues: they sounded exactly the same as they always had. Peas in a pod. This says a great deal about the BBC and the agencies, about the language used by all these organisations/corporations and their view of the world. The overlap grows and grows and grows. And another thing to watch and listen out for are the number of BBC reports which are courtesy of correspondent Z being taken care of and escorted by a particular aid agnecy: so the slant of the report favours the NGO in question, giving it international publicity and the BBC reporters gets cheaper travel and infromation… and everyone’s happy. But what has also intrigued me about the explosion of debates on the BBC’s decision not to air the appeal is the anger, particularly from some on the Left. The sudden support for these aid organisations and their appeals raises, for me anyway, a series of questions: when does a western aid agency stop being a representative of the West and its hypocritical policies to help people it helped kill or injure in the first place? When should that aid end? At what point will the aid to Gaza cease to be emergency or disaster relief, and start to be some sort of controlling arm of paternalism? When does western aid start to blind us from the politics at the heart of, in this case, Gaza and the regional politics? When do we cross the line too far, to pity the Palestinians as opposed to assisting them in self-determination? I sense, in some cases, that there are some who are so loathing of the BBC (and believe me, I sympathise) that they forget other factors at play in all of this, other larger issues that deserve consideration. The lady’s mobile phone rings. Her hands disappear in to layers of scarfs, the phone goes quiet. She lifts it to her ear and begins to talk Somali. Her voice becomes louder and louder until she is shouting into the phone, holding it in front of her mouth, then replacing it to her ear each time the caller responds. She talks all the way down Balls Pond Road. Or shouts, rather. The man, hooded, in shades, stands up and tuts at her. She smiles to him, nods and lifts a hand in peace. She keeps shouting in Somali and the man and I both hear the word mobile mentioned. Finally the call ends. Dalston. They both get off. The tall man with the hood and shades holding her arm gently to help her balance her bulging body clambering down from the bus. They wave at me as the bus pulls away, and she points at the large wrapped box at my side, smiling and smiling. The man has turned. He’s gone. I hug my box and remember Johannesburg. 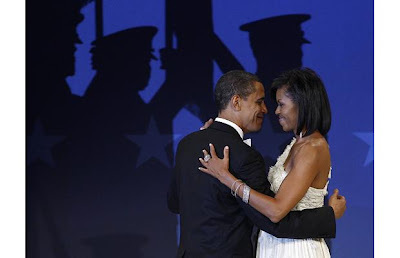 Footage of the uninspiring and stilted dancing displayed by Barack and Michelle instantly reminded me of the late Ousmane Sembene’s superb 1975 film, Xala. El Hadji (pictured below, on the right) is a Senegalese politician, cursed with impotence upon the day of his marriage to his third wife. 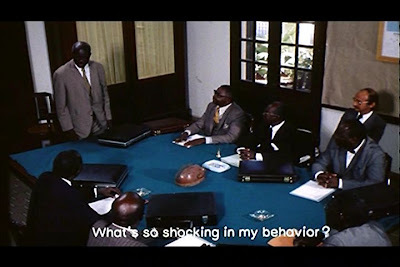 Xala is really a satire depicting the failure of new governments in independent Africa. 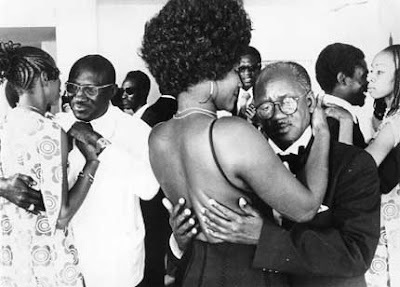 The impotence of El Hadji being the symbol for that failure, and the speed with which many new administrations failed (or were unable) to break away from the influence (and often, control) of the former colonial power. Xala also details beautifully, and hilariously, the greed of the first flush of independent Africa’s politicians. The film begins with the defeat of the French. 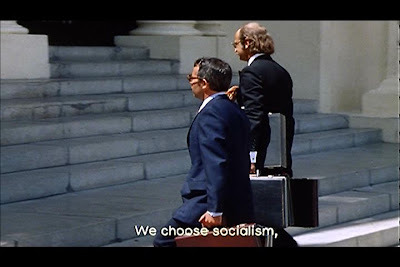 Within minutes, two French colonial administrators (below), who have just fled the central governing office, are seen returning with brief-cases. They enter the offices of the new independent adminstration – the new African government feigning some shock – and immediately open the brief-cases, to display wads of cash. The new administration is swiftly smiling and nodding pleased little heads. One of the French men remains behind, and becomes El-Hadji’s right-hand man. In fact, he becomes his advisor, financier and minder. So when I watched the footage of Barack at his desk for the first time signing executive orders, surrounded as he was by four or five officials (all white), again, I thought of Xala, and wondered what the great Sembene (below) would have been thinking now were he still with us. I know what I’m thinking. And what I’m hoping. But for now, I’m keeping that to myself. I think BO should be given a chance – to prove us wrong, or prove us right, or prove once again what a masterly film-maker the late Sembene was, making films that were timeless in their interpretations of power, greed and humanity. Elsewhere, foreign troops backed by the United States are evacuating Mogadishu. Never forget Somalia. Africa’s always the first to vanish at times like this. I love this idea, this notion, of writing as a way of “getting traction” on this world (whatever it is). The tension, the stretching; you, the writer, at one end of taught wire, the heavy world swinging at the other. Once, an old lady in a wheelchair swung at the end of my traction. I awoke, my knee being pulled so hard, I felt someone was trying to yank off my leg. It was dark, I could not see what it was that heaved at the metal weight at the end of my bed, the weight which swung from the wire which was knotted to the skewer that had been drilled and hammered through the top of my tibia. I loved so much to pick at the scabs on either side of the skewer where it emerged from the flesh. Each day, a crispy-wet wodge of scab. And I loved so much to stab the needle into my stomach, to show pitying visitors. Watch this! Rats would have died, but the poison saved my life. The old lady was my neighbour. We talked a great deal. Sometimes, late at night when the lights had gone off, she’d awake, push back the sheets, lower her self to the shiny floor, and tiptoe around the end of my bed up around the side, and stand just about where my waist lay, just about at the point where I would stab the needle into the pinch of flab. She would place a square washing-up bowl on the bed beside me, she would lift up her long nylon nightie and pull it over her head and stand, naked, at my bedside, ghostly without the form of cloth to shroud her. She would place the nightie in the plastic bowl. While she worked, she whispered, communicating subtly as to what it was she was doing. Hisses and whirrs I learned to understand. After the communication, she would remove the bucket from the bed and lower it to the floor, and then she would lower her arse over the bucket and release a long stream of urine over its contents. As she pissed, she sighed. Ahhhhhhhhhh! Abruptly, she stood up, put the bowl back on the bed beside me, and proceeded to wash the nightie in her urine, lifting it up and down up and down, running it through her fingers as if rubbing together butter and flour for a round of pastry. Still whispering, still explaining, Hush hush, hush hush, The Nurses! Hush hush dear. One night she did not undress. Instead, she stole the wheelchair that belonged to Helen, the woman across the ward, whose bed was occupied by an army of teddy-bears and dolls. Helen had rheumatoid arthritis. She’d had it nearly her entire life. She was 40 now, but the toys on her bed always made me wonder if she’d never grown up. Her body, useless and dependent, had kept her childlike forever, despite the pain and endless operations she’d survived: Helen understood suffering profoundly. So, as I was saying, the old lady stole Helen’s wheelchair one night, and tried to make an escape. Except the spoke of the lefthand wheel got caught in the metal weight that held my busted pelvis in traction. Hush hush, hush hush. She pulled back and forth, back and forth. I shouted at her to stop. She looked at me, the first time she’d ever looked me in the eye. Hush hush, she whispered, hush hush. She pulled and pulled and pulled and pulled. Until, eventually exhausted, she slumped into a deep sleep. Eventually, the scabs cleared up. One day they came – three nurses – to undo the traction. The weight at the end of the bed was released, the wire loosened and unclipped. What proved more complicated was the removal of the skewer. I was offered an anaesthetic. Oh no! I said, I want to feel the release, watch the blood and scab spurt out. It will, they said, it will. And it will hurt too, they said. Never mind. I keep the skewer in a pot. For kebabs, and stirring cocktails. It has a small knot in the middle which kept it stable in the centre of the tibia. The holes healed disappointingly quickly.